Today the TT Circuit Assen hosted the closest battle of the 2018 MotoGP season so far. At one point the front group consisted of eight riders and Movistar Yamaha MotoGP’s Maverick Viñales and Valentino Rossi were in the mix, both having the pace to fight for the win. The Dutch fans were on the edge of their seats as the ranking order kept changing. Since today is also Yamaha Motor Co., Ltd.’s 63rd anniversary, the factory riders were extra eager to secure a place on the podium. Ultimately it was Viñales who took third, whilst Rossi was ran wide in the latter stages of the race and finished in fifth place. Starting from sixth on the grid, Viñales was lying in ninth place as he approached the first corner, before settling into eighth as he completed the first lap. After six laps he moved up to sixth place and tapped onto the back of the five-rider group fighting for the lead, bringing Cal Crutchlow and Johann Zarco with him. Following a scrapping session with Zarco, Viñales passed Rossi on lap 12. Next on the list was Alex Rins, and with 11 laps to go the younger Yamaha rider secured fourth, closely followed by the other Movistar Yamaha bike. He was at that time the fastest rider on track, and whilst battling with his teammate he managed to overtake Jorge Lorenzo. Soon after he passed Marc Marquez for second place, at the start of lap 18, and went on to take the lead from Andrea Dovizioso with eight laps to go. However, a big wobble cost him time and saw him fall back behind Marquez to second place. The number 25 rider kept close, but they both ran wide, dropping him back to fourth. Yet, he still was not out for the count. Viñales fought his way back to second on the penultimate lap but came just came short trying to hold Rins behind him to the finish line. Despite a sensational last run through the Geert Timmer chicane, he ended the race in third place, just 0.039s from second and a 2.308s gap to first. At the start of the race, Rossi briefly fell back from third to fifth place, but soon regained his original grid position before the end of lap 1. The Doctor didn’t want the two front men to escape and pushed hard in the early laps. At the end of lap 4 he launched his first attack on Marquez and made it stick. Next up was Lorenzo, but contact between the two riders meant the Italian lost some time. It couldn’t have come at a more inconvenient moment, as the pressure from behind started to build up. On lap six the leading group had grown to a total of eight riders. Rossi dropped back as far as seventh due to the constant attack, but he is known for his quick comebacks. He worked his way back up the order, all the while also battling with his teammate. He was lying in fourth place until 5 laps before the end, when Marquez and Viñales ran wide. The crowd favourite took the opportunity to lead the race for the first time as they crossed the start/finish line, but it wasn’t to last. The others were not letting him get away and pushed him back to fourth. Rossi, however, had fight left in him. He regained second place, but this time he ran wide after almost colliding with Dovizioso in turn 1. With less than two laps to go, he was pushing 100 per cent. He managed to put in a final overtake on Dovizioso in the last corner, but it didn’t stick, making the Yamaha rider cross the finish line in fifth place, 2.963s from first. Rossi’s fifth place keeps him in second position in the championship standings with 99 points, 6 points ahead of teammate Viñales, who remains in third position. Yamaha stayed in third place in the Constructor Championship, with a 35-point margin to first, while the Movistar Yamaha MotoGP Team remain in first position in the team standings and now have a 11-point gap to the second team. MotoGP will be back in action in two weeks’ time at the Motorrad Grand Prix Deutschland, held at the Sachsenring from July 13th – 15th. 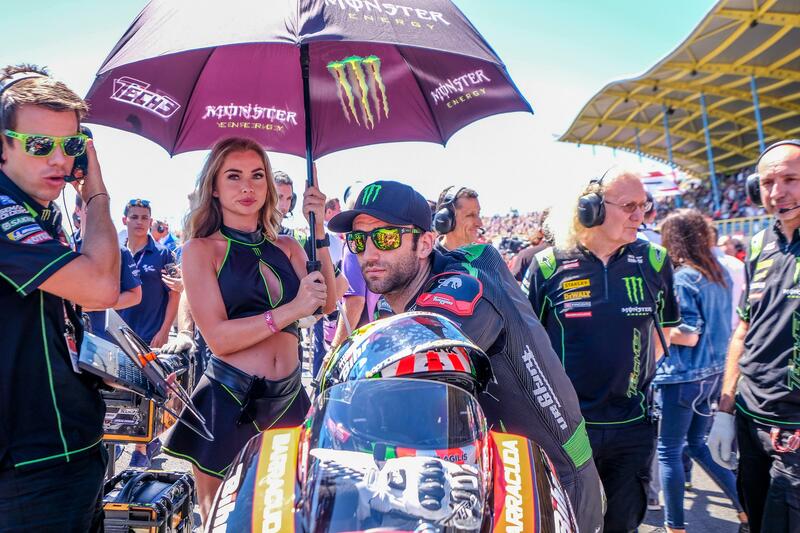 For the eighth round of the 2018 MotoGP World Championship Johann Zarco lined up in the third row of the grid and was fighting in the front group all over the demanding 26 laps race in order to eventually see the chequered flag in eighth position. Currently, the fast Frenchman sits in fourth position of the overall standings and is well in striking distance to P2, plus leading the independent riders championship with 81 points. On the other side of the Monster Yamaha Tech3 garage, Hafizh Syahrin had a tough time in his first ever MotoGP race at the challenging TT Circuit. The Malaysian fought hard with his fellow rookie Takaaki Nakagami in the latter stages and ultimately earned the newcomer laurels thanks to a penalty of his opponent. Yet, Syahrin aims to score points again in just a few days’ time at the German GP.